When the Empire State Building was completed in 1931, it became the tallest skyscraper in the world. While it may no longer be the tallest, this massive but graceful Art Deco masterpiece remains unsurpassed as an icon of New York. When the Empire State Building was completed in 1931, it became the tallest skyscraper in the world, a title it held until the first tower of the World Trade Center reached its full height in 1972. While the ESB may no longer be the tallest, this massive but graceful Art Deco masterpiece remains unsurpassed as an icon of New York, its prominence in the sky forever a symbol of the city's greater striving. It measures 1,454 feet from the street to the antenna's tip, has its own zip code (10118), and is served by 73 elevators. The colored floodlights that illuminate the top of the building were added in 1964, when the much-loved tradition of changing the colors for holidays and other special events began. It used to take six hours for a crew to switch the gels on the lights for a new look, but a computerized, energy-efficient LED system was installed in 2012, giving lighting designers a range of 16 million color combinations to choose from. 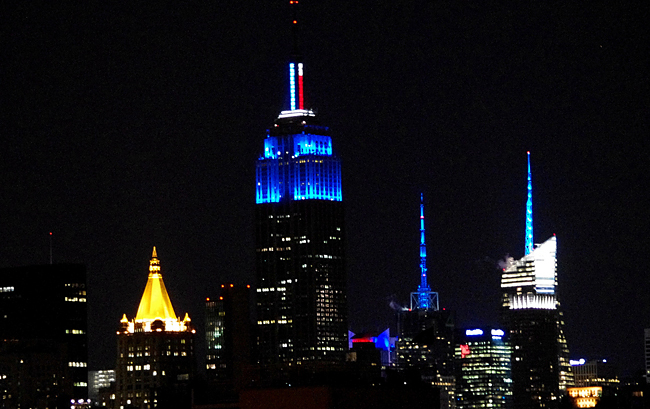 There's always some significance to the color scheme, whether it's to support a local sports team, to memorialize a famous individual (on Frank Sinatra's 80th birthday, the building was blue in honor of his nickname, Ol' Blue Eyes), or to mark a special occasion. When Fay Wray, who played King Kong's love interest, died in 2004, the building went dark for 15 minutes. On the foggy Saturday morning of July 28, 1945, a disoriented pilot flying a B-25 bomber crashed into the Empire State between the 78th and 80th floors. Remarkably, the resulting fire was contained in just 40 minutes, and only 14 people were killed -- three on the plane and 11 in the building. An elevator operator survived a 75-foot plunge when the elevator's cables failed after the crash. 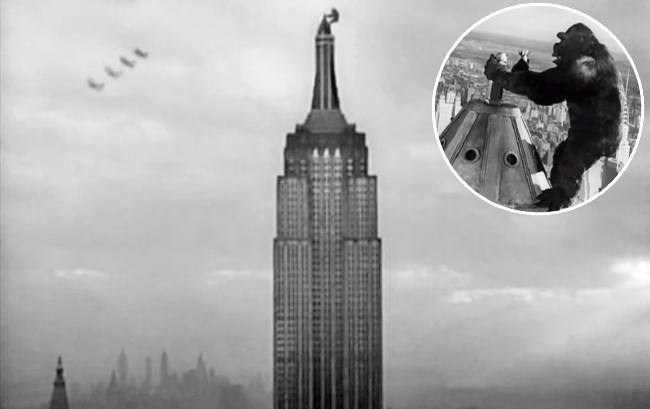 Cool, slim and elegant, the Empire State Building is movie royalty of the first order. Its cinematic career started just two years after its completion, with the 1933 classic King Kong, which featured the giant ape unforgettably climbing to the spire, where he swatted away planes before tumbling to his doom. The building has figured in countless movies and TV shows since, but if you're going to see only one before you visit, it should be the 1957 heartbreaker romance An Affair to Remember, starring Cary Grant and Deborah Kerr as star-crossed lovers who have a fateful appointment to meet on the observation deck. A remake of an earlier film called Love Affair, An Affair to Remember inspired Nora Ephron's 1993 hit Sleepless in Seattle, which also features the ESB prominently. You can probably skip Andy Warhol's eight-hour silent film Empire, which consists entirely of a static shot of the building at night -- projected in slow motion. Completed just as the Depression reached its height, the building was nicknamed the "Empty State Building" because it had a vacancy rate of as high as 77 percent in the years after it opened. There's a lightning rod at the very tippy-top of the building's antenna, and it takes a lot of hits—as many as 100 per year. Every year, a few hundred incomprehensibly fit people compete in the invitational Empire State Building Run-Up, first held in 1978. The 1,576-step race from the lobby to the 86th floor observation deck involves an elevation gain of 1,050 feet. The record time? A cool nine minutes, 33 seconds.